Spearheaded by Culinary Director Michel Mustiere, Maître Cuisinier de France, Velas Resorts in Los Cabos, Vallarta-Nayarit, and Riviera Maya are once again participating in the Annual Goût de France (Good France) on March 21st. Spearheaded by Culinary Director Michel Mustiere, Maître Cuisinier de France, Velas Resorts in Los Cabos, Vallarta-Nayarit, and Riviera Maya are once again participating in the Annual Goût de France (Good France) on March 21st. 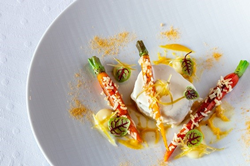 Each resort will feature dedicated menus in celebration of French gastronomy. Highlights of the dishes served include Leek Fondue and Kalamata Olive Tartlet, Escargot Tempura dressed with a vanilla scented blanquette sauce, Braised Veal & Pea Fricassee, and Traditional Crispy Mille-Feuille with aromatic lavender and thyme ice-cream. Accompanied by French wines and champagnes, the dining experience is complimentary for guests staying at the resorts. Dishes vary based on the resort.